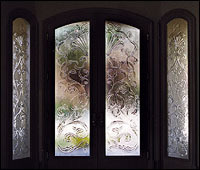 UltraGlas® is embossed, kiln-formed art glass for virtually all architectural applications. The creators of UltraGlas® are a leader in their field and are responsible for pioneering, developing and evolving kiln-formed glass technology. For many years, UltraGlas® almost exclusively by esteemed architects and interior designers in their upscale commercial and hospitality projects. An extensive array of standard and custom UltraGlas® solutions may now be commissioned for all manner ofresidential and business applications. The possibilities are endless! UltraGlas® can be configuredto accept any glass hardware, can be made in almost any size, thickness, and shape—and provides results that contiue to inspire "oohs and ahhs." 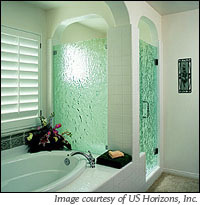 SGO Designer Glass is proud of it’s reputation as a "problem solving" company. 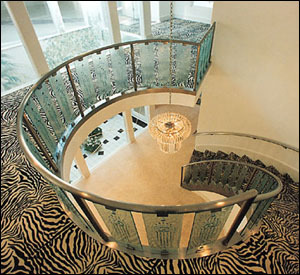 We are always seeking to extend the boundaries of glass and design. Working together with UltraGlas®, our artistic teams can combine beauty and function to create the perfect solution for your space. 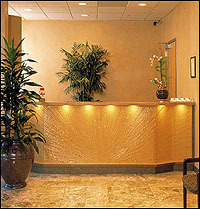 The SGO Designer Glass experience begins in either our studio, your home or your business. During this meeting, we will learn everything we need to know about your intended project, your needs, your preferences, your concerns and desires. 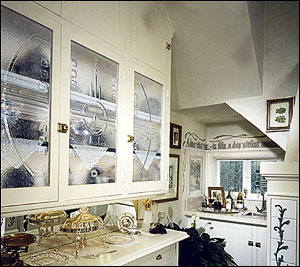 We will show you numerous glass samples and other pertinent references and discuss all of your options. If you are unsure of what it is you'd like to do, not to worry, we can help. Our design consultants have numerous tools and templates and are ready to assist you in developing your ideas. Average fabrication lead time is 6 to 8 weeks from the completion of designs.